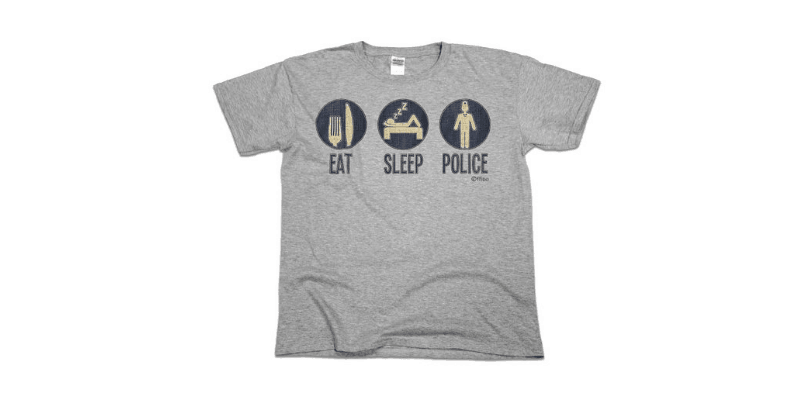 Get this Gift T-shirt for Police officers, which is very relevant to their job! This the cycle most officers find themselves stuck in! This Police T-shirt would make a great gift for the crime fighting Police Officer that you know! EAT – SLEEP – POLICE is the cycle most officers find themselves stuck in because of commitment, professionalism and pride in their job! This is a 100% cotton t-shirt which comes with a “no quibble money back guarantee”, so take a look and if your stuck for a great present or leaving gift, this might be what you’re looking for!